Rooibos is my favorite tea! It has a lot of flavor and personally I prefer it over green tea! Naturally I was quite amazed to find that it has so many benefits and actually when it comes to antioxidant power it’s 50 times more powerful than green tea! Rooibos aka Red Bush (pronounced roy-boss) is grown in the Western Cape Province. The leaves are actually green but turn red when oxidized. Health Benefits of Rooibos Tea! 1. Rooibos tea supplements the daily amounts of calcium, manganese and especially fluoride, needed for the development of strong teeth and bones. 2. Rooibos tea, like green and black tea, has been found to be rich in anti-oxidants and flavonoids. In fact, Rooibos tea has been found to have as much as 50 times more SOD than Green Tea. It also has other anti-oxidants not found in other teas. 3. The effect of free radicals (a by-product of normal cell function) in the process of aging and declining of the immune system is limited by the anti-oxidants in Rooibos tea. 4. Rooibos tea is also strongly recommended for people suffering from irritability, headaches, disturbed sleeping patterns, insomnia, nervous tension, mild depression or hypertension. 5. Rooibos tea contains no caffeine and therefore has a soothing effect on the central nervous system. Rooibos tea is also low in tannin and therefore does not have a negative effect on the absorption of iron and proteins into the body. 6. Contains alpha hydroxy acid and zinc which is great for the skin. You can even apply it directly to the skin to help with acne, eczema and sunburn etc. 7. People with kidney stones can drink it because there’s no oxalic acid. 8. Rooibos tea has anti-spasmodic properties, thus relieving stomach cramps and colic in infants. Rooibos tea also relieves stomach and indigestive problems like nausea, vomiting, heartburn, stomach ulcers and constipation. 9. 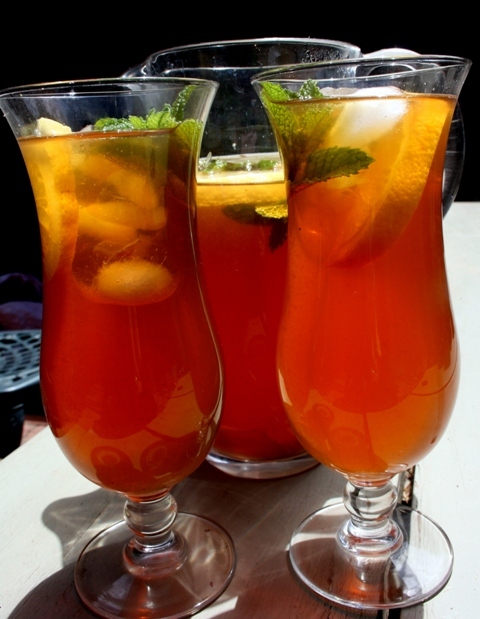 Rooibos tea is completely pure and natural, as it contains no additives, preservatives or colorants. It is a soothing drink for people on a calorie-restricted diet. Rooibos tea is an all day drink which can be used as a pick-me-up in the morning, a superb thirst-quencher during the day and at night it helps you to relax and sleep well. 10. Japanese scientists, such as Matatoshi Nakano also found Rooibos to be beneficial in the treatment of high blood pressure, diabetes, mellitus, atherosclerosis, allergic diseases, various dermatitis diseases, liver diseases and cataracts. Was this information helpful to you? If so please share! Tell me do you drink tea if, so what’s your favorite? « Previous Post 7 Health Benefits of Avocado! Next Post » How to Get Tight, Toned and Lean!